The Potter County sheriff wanted to let people know there’s a new armored truck in town. 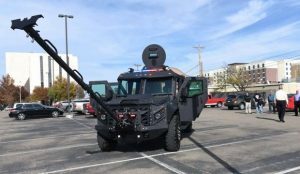 On Thursday, Sheriff Brian Thomas and deputies unveiled a new, $250,000 armored personnel carrier that Thomas said would bring his office up to speed with other agencies and help deputies better respond to shootings. The hulking, unmarked personnel carrier with a Ford F-550 chassis and engine had already caught some people’s attention. The day before, deputies had taken it to serve a search warrant. “We got lots of looks at us,” Thomas said. The armored truck — marketed as Ballistic Armored Tactical Transport, or BATT — is designed to stop .50 caliber rounds. Features include a blast mitigating floor, internal armored firewall, rifle rated roof protection and a fully armored hood clip. It can reach speeds up to 80 miles per hour with 12 to 14 fully geared officers inside, the website says. Thomas said the new vehicle would be useful during active shooter or hostage situations. He said the need for the vehicle was apparent after at least four recent incidents where rifle-wielding suspects made it unsafe for deputies to approach. 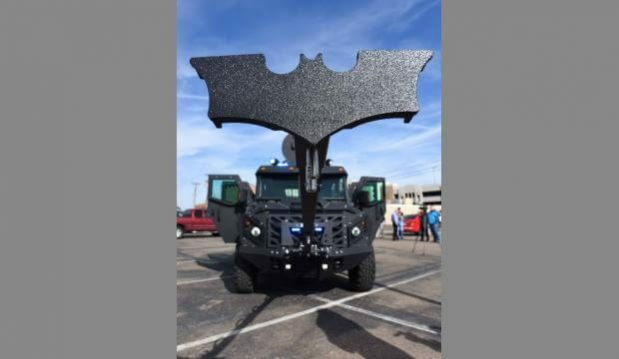 In those situations, the county relies on Randall County Sheriff’s Office and the Amarillo Police Department, which have their own armored vehicles. In one incident that he recounted to Potter County commissioners earlier this year, a person with a rifle was threatening to shoot motorists on Interstate 40. “Actually, I had to shut down I-40 for about an hour and a half until we could get down there,” he told them. The BATT costs $250,000, but is being paid for from the sheriff office’s federal forfeiture fund, according to the county auditor’s office. “Taxpayers didn’t pay for it,” Thomas said Thursday. The fund had $358,000 in it Thursday with about $198,000 set aside to finish paying for the vehicle, the auditor said. Thomas showed off a hydraulic ram at the front of the vehicle that swung up and down and side to side.